PTZs, like fixed cameras, are moving to megapixel. With PTZs, though, real questions remain about the value of going to megapixel. Some people say that megapixel eliminates the need for PTZ, regardless of the PTZ's resolution. Our Fixed MP vs SD PTZ camera test results show that such claims are simply false. However, another major concern exists with Megapixel PTZ cameras: While SD PTZs commonly have optical zoom ranges of 30X - 40X, Megapixel PTZs optical zoom ranges are generally only 10X - 20X. This is not an accident. Today, and for the foreseeable future, technical and cost limitations exist in making MP lenses with the large zoom ranges common for SD PTZs. While Megapixel PTZs offer more resolution than SD PTZs, their optical zoom range is much smaller. This raises a big concern: Which PTZ - SD or Megapixel - can see the farthest? If SD PTZs have a farther maximum coverage area, going to megapixel PTZs would bring a major drawback as maximum coverage area is a key concern. In this report, we tested an SD PTZ against 2 MP PTZs to better understand the tradeoffs involved. We did a series of test in a large parking lot to simulate real world conditions for PTZ deployment. The tests were done both during the day and at night to see how performance varied across lighting conditions. Wide Field of View - When the PTZs are zoomed out wide, with the same FoV, what difference between MP and SD can be seen? Moderate Zoom and Tracking Subject - When the PTZs are zoomed in moderately to track a suspect in the middle of the scene, what differences are observable? Maximum Zoom In - When all the PTZs are zoomed in as far as they can go, which PTZ can see the furthest? In light of these findings we recommend that users strongly consider HD PTZs over SD PTZs. They produce the same (or perhaps slightly better) maximum distance range and provide superior contextual awareness as the HD/MP PTZ can deliver the same image details over a wider field of view. Pricing is similar so product cost should not be a problem. Bandwidth and storage are a consideration and more so than with a fixed camera as a moving PTZ will consume 2 to 3x more bandwidth than a fixed camera, all else being equal. Do not be mislead that a higher optical zoom ratio, e.g. 40x, is massively better than a lesser one, e.g. 20x. Judging expected performance of a PTZ based on this metric should be avoided as it can be entirely misleading. A 40x PTZ really only has twice the range of a 20x PTZ, not the extra 20x the metric might imply. Focus first on the minimum lens angle. This can generally be found listed in the specification sheet (e.g., - the Canon MP PTZ lists 2.8 degrees as the minimum lens angle on its specification page while the Canon SD PTZ lists 1.5 degrees as the minimum lens angle on its specification page. If you cannot find it listed, you can calcuate with two other common metrics: (1) the imager size (e.g. 1/4", 1/3" etc.) and (2) the maximum focal length (e.g. 136mm, 94mm, etc.). Plug these two values into certain lens calculators and they can give you the corresponding minimum lens angle. For example the SD PTZ (Canon VB-C60) we tested has a 1/4" imager and a 136mm maximum focal length. Based on these two values the minimum lens angle is 1.52 degrees. On the other hand one of the HD PTZs (Canon VB-M40) we tested has a 1/3" imager and a 94mm max focal length. This yields a miminum lens angle of 2.93 degrees. The SD's minimum lens angle is roughly half that of the HD's. Thus the SD PTZ is able to achieve 1/2 the horizontal FoV when maximally zoomed. If the horizontal resolutions were the same then the 1.52 degree PTZ would provide roughly twice the ppf as the 2.93 degree PTZ. However, this is not the case as the SD provides 640px horizontally and the HD 1280px. Thus the SD has the advantage of a HFoV that is ~2x narrower but with only half the pixels as the HD (640 versus 1280). The HD camera has to deal with a ~2x wider HFoV, but with twice the number of pixels. As such they are roughly equivalent in ppf when fully zoomed despite one being 40x and the other being only 20x. The PTZs are normalized to ~55 degree lens angle at this relatively short distance of ~30ft. As a result the HD PTZs have twice the pixels per foot in the same FoV width as the SD PTZ. For the same overall coverage area the HD PTZs provide twice the ppf as the SD PTZ, and this results in a more detailed image. At this FoV the HD PTZs provide a high likelihood of identification. The WV-SC385 exhibits a slightly sharper image than the VB-M40. The relatively lower light dimishes image quality slightly across the board, but overall HD still provides greater ppf and subject/object details than the SD at this normalized FoV. 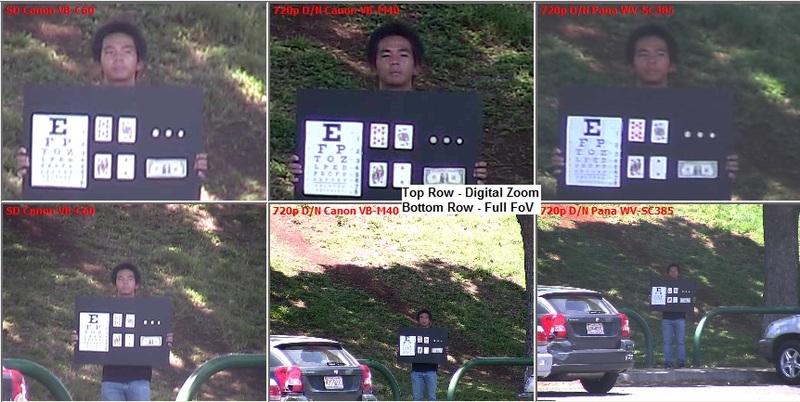 In this scenario PTZs are optically zoomed to ~10ft HFoV at the subject's location ~100ft away. Given that HFoVs are normalized, the HD PTZs provide ~2x more ppf than the SD PTZ. Even though the subject is located ~3x further away versus the previous 'near' scenario, optically zooming into the subject to a tighter HFoV increases the ppf by ~3x across the board. As a result, details are strong in all three PTZ images. However, with twice the ppf resolution, the HD PTZs manage to deliver slightly more details than the SD PTZ. Again, despite a ~3x increase in distance to subject versus the 'near' scenario, image quality is considerably better across the board due to optically zooming in to a tight ~10ft HFoV versus the ~30ft HFoV of the 'near' scenario. The HD PTZs again deliver twice the ppf at this normalized HFoV over the SD and as such provide slightly better detail and clarity. Identification is fairly likely for SD and HD alike at this fairly narrow FoV. Note the VB-M40 is somewhat under-exposed compared to the SD and WV-SC385 PTZs. In this scenario, each PTZ is zoomed in maximally to a subject ~230ft away. The SD PTZ is able to obtain the narrowest HFoV of ~6ft (136mm focal length/1.52 degree lens angle). This is roughly half the HFoV that the HD PTZs are able to obtain. As a result ppf is very close (~100ppf) across all three PTZs. Optical zoom allows all PTZs to obtain a fairly narrow HFoV even at this distance of ~230ft. As a result ppf is high across all cameras (~100ppf) and details are strong on the subject/object. Note the SD PTZ needed a HFoV roughly one-half that of the HD PTZs in order to achieve similar results. It accomplished this because of a minimum lens angle (1.52) that is roughly one-half that of the HD PTZs (2.93/VB-M40 and 3.25/WV-SC385). Light levels are at their lowest in this corner of the parking area, and has a clear negative impact on image quality across the board. Furthermore, results are slightly unexpected as the SD's image, despite similar ppf as the HDs, is slightly less detailed. Note in the analogous daytime scenario its image quality was on par with the HD images. Secondly, the SD is somewhat under-exposed relative to the HD PTZs (especially the Panasonic WV-SC385). All PTZs were normalized to a 1/30s max exposure length for any low-light/nighttime test scenarios. For both 'Near' and 'Mid' range scenarios all PTZs were zoomed into the same HFoV (same lens angle). For the 'Far' range scenario each PTZ was maximally zoomed. Thus the 'Far' range images have a unique HFoV for each corresponding PTZ.